Affordable Care Act Makes This Tax Season Painful For Many : Shots - Health News Figuring out the penalty for not signing up for health insurance is just one complication. 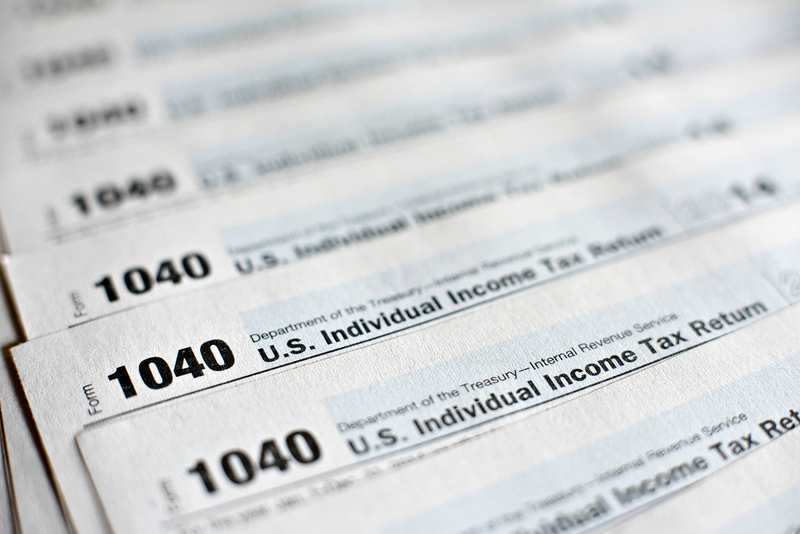 Tax filers who made more money last year than they anticipated may have to pay back some of their subsidy. Tax preparation software doesn't always calculate the complexity of Affordable Care Act subsidies and credits properly. This tax season, for the first time since the Affordable Care Act passed five years ago, consumers are facing its financial consequences. Whether they owe a penalty for not having health insurance, or have to figure out whether they need to pay back part of the subsidy they received to offset the cost of monthly insurance premiums, many people have to contend with new tax forms and calculations. Christa Avampato, for example, bought a silver plan on the New York health insurance exchange last year. Initially, the 39-year-old was surprised and pleased to learn that she qualified for a $177 premium tax credit that is available to people with incomes between 100 and 400 percent of the federal poverty level. The tax credit, which was sent directly to her health insurer every month, reduced the monthly premium she paid for her $400 plan to $223. But a big check from a client at the end of last year pushed the self-employed consultant and content creator's income higher than she had estimated. When she filed her 2014 income taxes earlier this month she got the bad news: She must repay $750 of the tax credit she'd received. Avampato, who has moved to Florida, paid the bill out of her savings. Since her higher income meant she also owed more money on her federal and state income taxes, repaying the tax credit for her health plan was "just rubbing salt in the wound," Avampato says. But she's not complaining. The tax credit made her health insurance much more affordable. Going forward, she says, she'll just keep in mind that repayment is a possibility. It's hard for many people to perfectly estimate their annual income in advance, and changes in family status — such as marriage or divorce --can also throw off that estimate. The size of the premium tax credit is based on a family's income. Like Avampato, 52 percent of people who enrolled in health insurance plans on the exchanges had to repay part of the subsidy they'd received to offset premiums. That's according to an analysis by H&R Block of the first six weeks of returns filed through the tax preparer. The average repayment was $530, while about a third of marketplace enrollees got a tax credit refund of $365, on average, according to H&R Block. The amount that people have to repay has a cap that's based on their income. People whose income tops 400 percent of poverty ($45,960 for an individual) have to repay the entire premium tax credit. The message for taxpayers is clear: If your income or family status changes, go back to the insurance marketplace now — and as necessary throughout the year — to make adjustments so you can minimize repayment issues when 2015 taxes are due. Some people owe a penalty for not having health insurance. For 2014, the penalty is the greater of $95 or 1 percent of income. The H&R Block analysis found that the average penalty people paid for not having insurance was $172. Consumers who learn they owe a penalty when they file their 2014 taxes can qualify for a special enrollment period to buy 2015 coverage, if they haven't already done so. That would protect them against a penalty on their next return. Also, tax filers may be able to avoid the penalty by qualifying for an exemption. Tax preparers often use software to help them complete people's returns, and the software includes the forms to apply for exemptions. For the most part, the software is up to the task, says Tara Straw, a health policy analyst at the Center on Budget and Policy Priorities who manages a Volunteer Income Tax Assistance site in the District of Columbia. But it comes up short with some of the more complicated calculations, she says. A case in point: applying for the exemption from the health insurance requirement because coverage is unaffordable. Under the health law, if the minimum amount people would have to pay for employer coverage or a bronze level health plan is more than 8 percent of their household's income they don't have to buy insurance. That situation is likely to be one of the most common reasons for claiming an exemption. But to figure out whether someone qualifies, the software would have to incorporate details such as the cost of the second lowest-cost silver plan available in that region, as well as the lowest cost bronze plan. The software can't do that, so tax preparers must complete the information by hand. "That one, in particular," Straw says, "has been vexing."